Most of you already know that I spent most of 2013 working as a bike messenger at Krick in Genève. One of my main fears when I started – and I mentioned it to PHK, the owner – was that I wouldn’t know the street names well enough. But that was a problem that could easily be solved: just learn them. From day one, I wrote down on a spreadsheet every company’s address where I picked something up or dropped a delivery. I would then spend the 20 minutes during breakfast mapping the most recent entries to the list to my mental map of Genève. That list had the other advantage that if the dispatcher didn’t give me a complete address, I could just look it up on the spreadsheet on my iPhone. This rarely happened, but it’s always good to have a plan B. I’m pretty sure this is more than any of my messenger buddies ever did, but that’s just how I function. Over the course of 10 months, my list of addresses grew to a whopping 990 entries. At Krick, a default city center delivery with no overweight costs CHF 16. For each additional kilometer, CHF 5 are added to the fare. After a couple of weeks, I had the feeling that this rule was enforced a bit loosely by PHK. So I augmented my list of addresses with the data needed to check how the rule was applied in reality. This is what I call the Krick zones. You can play with a slightly bigger version over here. there is some obviously wrong data, for example the orange zones inside the blue city center. These are probably errors on my part, when I entered the addresses into the spreadsheet. the feeling I had about how the fare zones are wrongly applied was right. Please have a look at the next diagram. 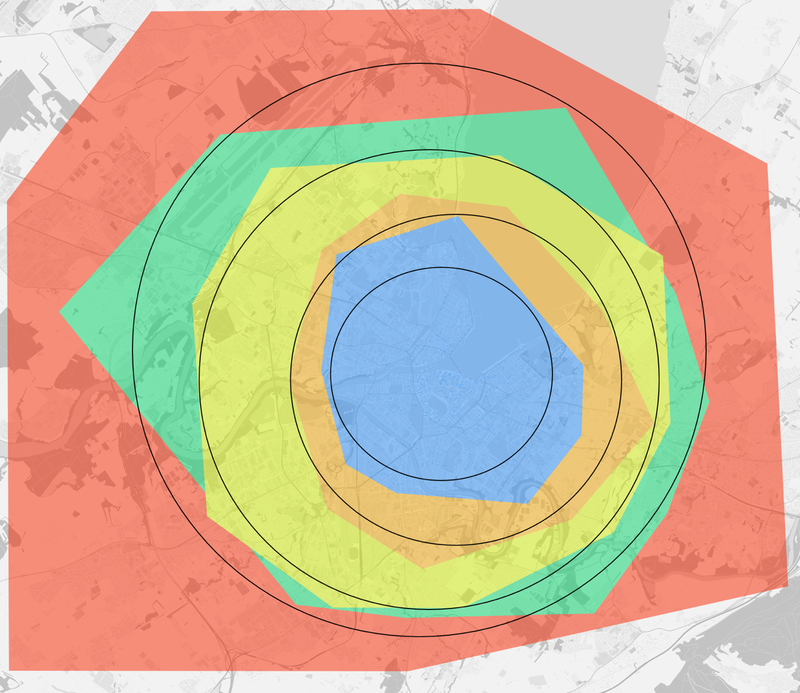 I tried to manually – and somewhat coarsely – adjust the zones of the map and drew some circles to see if the zones grew regularly with each kilometer. They obviously don’t, because the circles are neither concentric, nor evenly spaced. Like I wrote above, I collected the addresses of Krick’s clients every day and entered them in a spreadsheet. Using a nifty little tool, I converted the street addresses from the spreadsheet to latitude-longitude coordinates. Then I followed this very complete quickstart to install TileMill. Note that in the guide, they suggest two ways of installing a PostgreSQL database. I chose the more easy Postgres.app, not PostgreSQL/PostGIS with homebrew or from KyngChaos. I then downloaded the Switzerland dataset from here or maybe here. I honestly don’t remember, I did all this one year ago. TileMill is a tool to create maps. It has a nice styling language similar to CSS. OpenStreetMap (OSM) is like Google Maps or Apple Maps, but with open data where basically anyone can contribute. 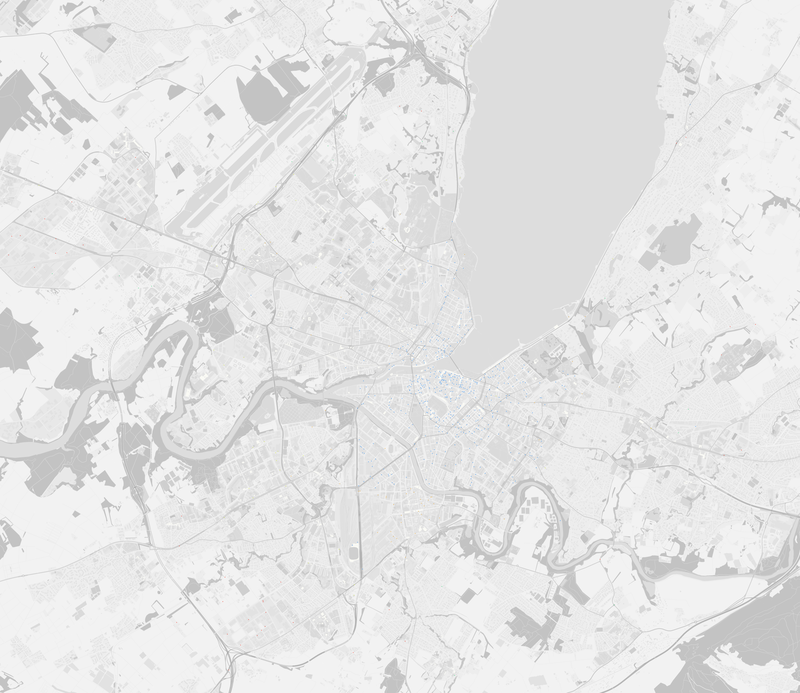 OSM Bright is more or less the glue between OSM data and TileMill – as far as I understand. Postgres.app is a PostgreSQL/PostGIS combo, basically the database where the geographic data used by TileMill is stored. Finally, osm2pgsql, like its name suggests, magically converts OSM data to PostgreSQL data. You might need to sudo some of those commands. Finally go to http://localhost:20009/ in your browser to use TileMill. I repeated the colors because I couldn’t find more than 5 really distinct colors and I was too lazy to dive into color theory. That’s it for the map. Quite easy actually. 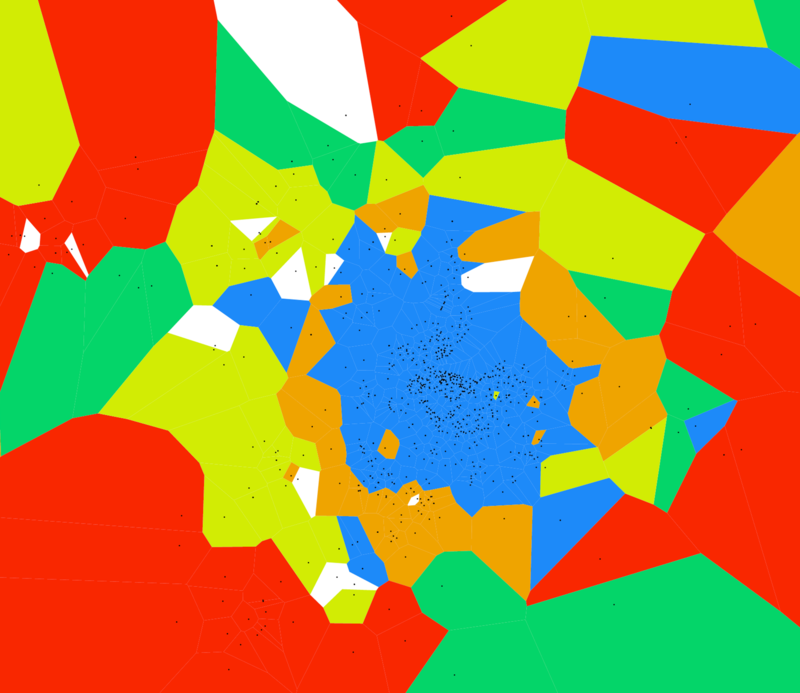 Things got a little hairier when I tried to figure out how to do the Voronoi diagrams. I quickly realized I should use D3. I struggled a bit with map projections, various json formats, SVG paths, SVG basics, D3 geo paths etc. In short, I went through a lot of trial and error, and still haven’t figured out map projections. But anyway, you can have a look at the code on my GitHub. And BTW speaking of GitHub, they have a feature to automatically preview geojson files, and here’s that feature applied to the Krick data. Manu: Est-ce qqun arrive à me dire quelle taille en pixels une image (png) doit faire pour être imprimée en A2? En sachant que je suis fixé à 72dpi. Manu: Est-ce que le “dots” dans dpi est synonyme de pixels? Max: La résolution pour impression sur papier c’est 300dpi! (entre 250 et 300dpi) en dessous c’est pas top comme qualité. 72 c’est vraiment que pour le web. Après quand tu as une image que tu veux imprimer et donc passer en 300dpi, il faut que de base elle ait une dimensions de pixels déjà importante car on ne touche pas au pixel au passage à 300dpi sinon on augmente le nombre de pixels mais qui seront des faux pixel créés à partir des autres et n’influencera en rien sur la qualité finale et au contraire fera que tu as une image très lourde, plusieurs Go. Donc quand tu vas passer ton image en 300dpi dans toshop dans “Taille image” attention que la case “Rééchantillonage” ne soit pas cochée. Par contre quand tu passes en 300dpi tu perds en dimensions. Ce qui est logique si on veut garder le même nombres de pixels. Par exemple, une image qui fait 560x420 mm et 1600x1200 pixels en 72 dpi fera 135x100 mm en 300dpi et toujours la même taille de pixels comme expliqué avant. Donc il faut que ton image soit grande de base car pour arriver à un format d’image A2 en 300dpi sans perte de qualité il faut que ton image ait 4961 × 7016 pixels. Si ton image a été prise avec un reflex tu devrais avoir la qualité requise pour faire du A2. Max: et pas oublier de mettre en CMJN ! I’ll leave that here for future reference. See, sometimes Facebook can be useful.